The tree below was redrawn from the information and cladograms of the Phylogeny Wing of the University of California Museum of Paleontology. 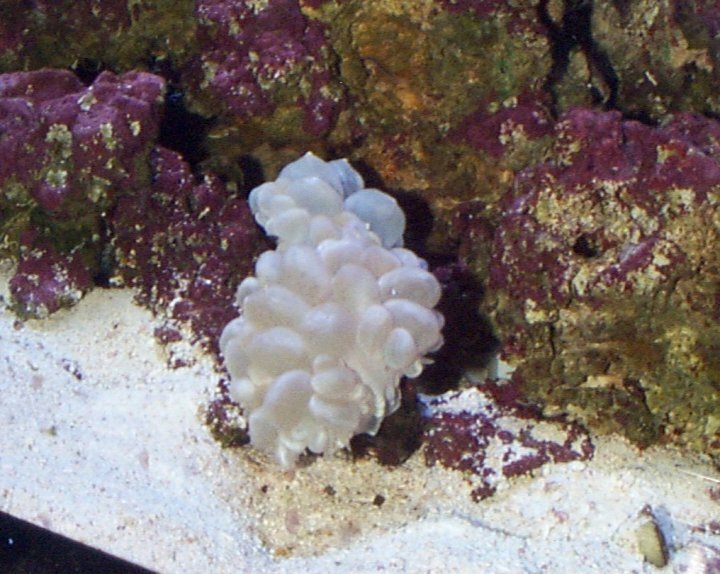 The animal phyla represented have been selected for familiarity and to provide context for phyla often exhibited in aquaria and that might be seen at the James R. Record Aquarium of the Fort Worth Zoo. My selection of which "minor phyla" to include both on the tree and in the list below is frankly idiosyncratic. Common names have been used to identify each of the phyla when one was available. Below you will find a listing of the scientific names of each phylum, and examples of its more common members. Links to representative animals for phyla that can be seen at the zoo have been provided, both from the phylum list and from the tree. Contrary to my usual practice at WhoZoo, I have also included links from the list to discussions of less familiar phyla at other web sites; these are marked with an asterisk(*). 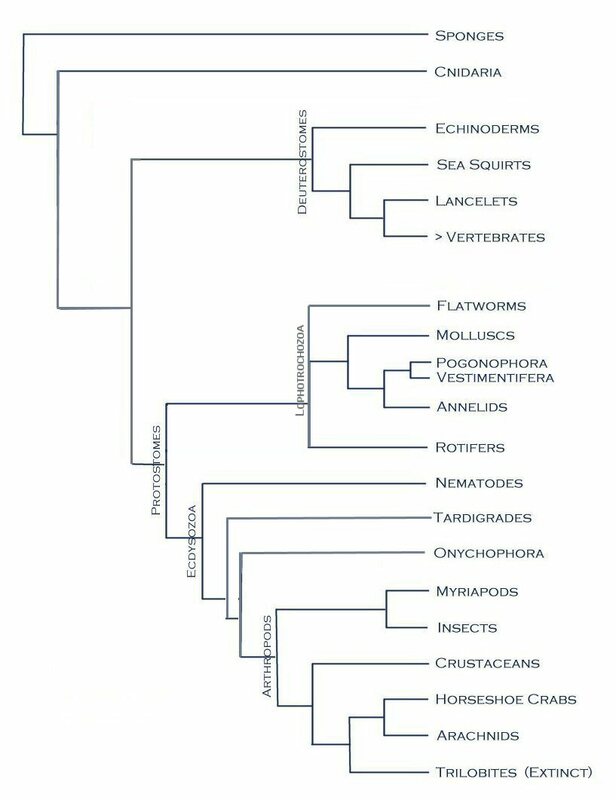 Sources for information on these animals are included in the source list below the tree. 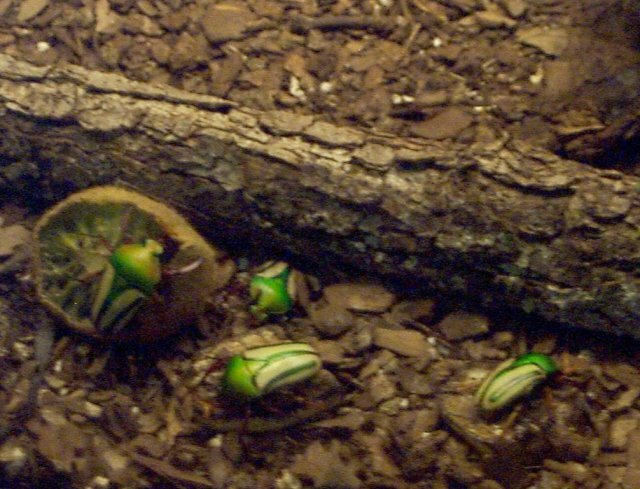 Only animals that can be seen at the James R. Record Aquarium have been linked from the tree itself. Note: with the closing of the Aquarium, these animals can no longer be seen at the Fort Worth Zoo. 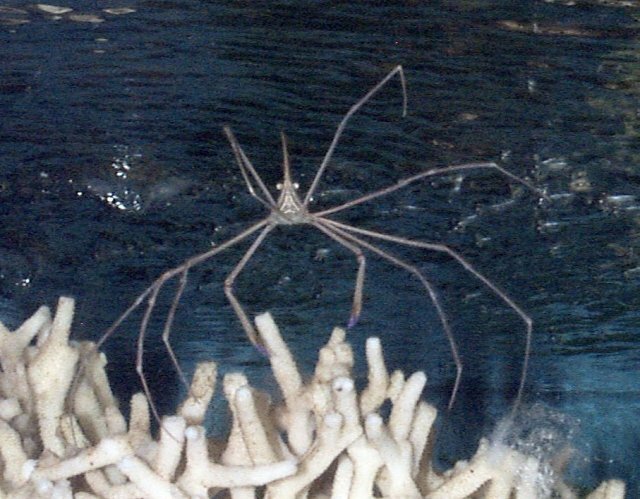 Phylum Pogonophora: this relatively unfamiliar phylum has been included because the Vestimentiferan worms -- the giant red tube-building worms that colonize the waters around *deep sea volcanic vents -- are closely related to them. Insects: beetles, flies, butterflies, roaches, ants and bees, bugs, grasshoppers, phasmids (AKA stick insects)and other insects. 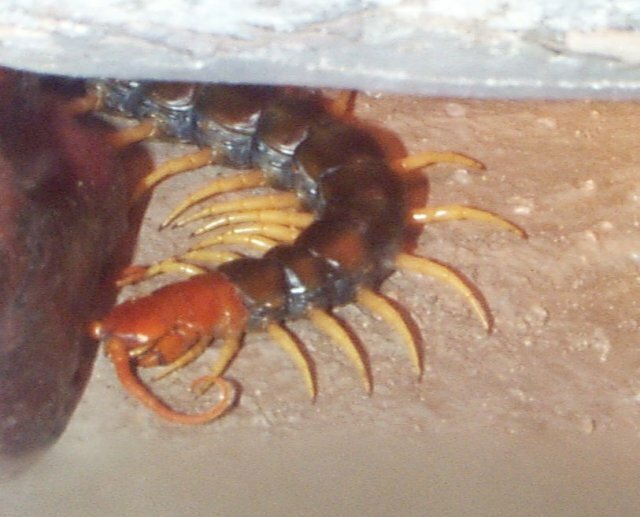 Crustaceans: crabs, shrimp and lobsters, and the giant isopods that can be seen in the James R. Record Aquarium. Arachnida: spiders, scorpions, ticks and mites. Trilobita: the *trilobites -- extinct arthropods commonly found as fossils. Additional notes: Deuterostomes are animals whose embryos develop a mouth as a secondary embryonic structure opposite to the blastopore, which opens into the primitive gut. Protostomes are animals that develop their mouths from or very near to the blastopore. Ecdysozoans are animals that molt their cuticles or exoskeletons as they grow. 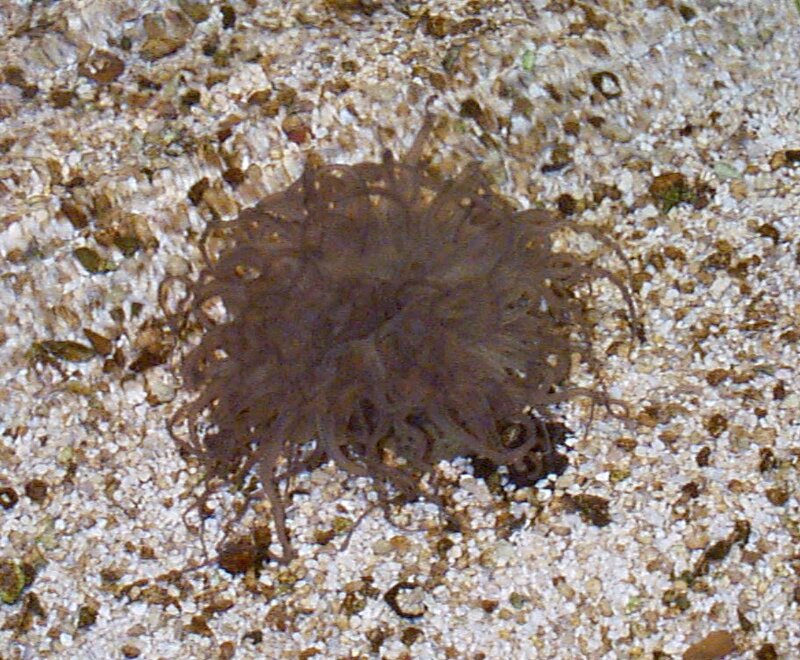 Lophotrochozoans are a group of animals that have either a trochophore (toplike) larva or a feeding organ (lophophore) composed of a ring of ciliated tentacles. Allen G. Collins, Brian R. Speer and Ben Waggoner. The Metazoa: University of California Museum of Paleontology. Ben Waggoner and B. R. Spear. Introduction to the Flatworms. University of California Museum of Paleontology. Ben Waggoner. Introduction to the Lancelets. University of California Museum of Paleontology. Hot Vents. Marine Biology at State University of New York. Roy Winsby. Rotifers and How to Find Them. Ben Waggoner and Brian R. Speer. Introduction to the Nematoda. University of California Museum of Paleontology. Ben Waggoner and Allen G Collins. Introduction to the Onychophora. University of California Museum of Peleontology. University of California Museum of Paleontology. 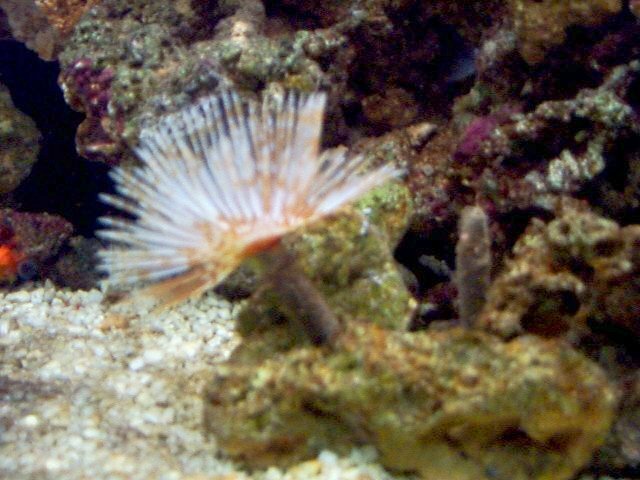 Introduction to the Ecdysozoa.